No Longer Empty's "If You Build It" has been, hands-down, the most exciting visual art event Harlem has experienced in modern history. Taking place at the future home of Broadway Housing Communities' Sugar Hill Apartments, the long-anticipated architectural project has attracted as many admirers as the spectacular art currently nestled inside. 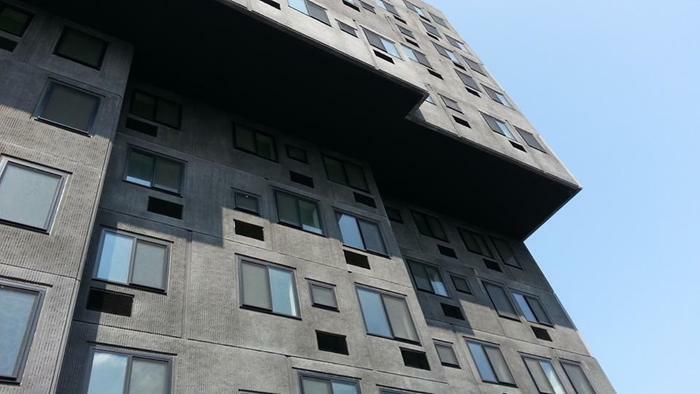 Designed by world-class architect, David Adjaye, the building is Broadway Housing's seventh Upper Manhattan housing development. It is the non-profit's first, however, to be built from the ground up - a larger-than-life feat they've accomplished with support from a wide variety of sources, including all levels of government, private equity and philanthropy. It will become home to 124 families, with 25 units reserved for households currently in the NYC homeless shelter system. Embracing a successful supportive housing model and understanding the power of art to change lives, BHC has incorporated arts and education into housing projects since 1997. This structure will boast The Sugar Hill Children's Museum of Art & Storytelling on the ground level, an Early Childhood Education Center, and a 9th floor gallery of rotating art, where cultural and civic programs and activities are also likely to take place. No Longer Empty - an organization that transforms vacant spaces into momentary art venues - has hosted "If You Build It" to introduce the Sugar Hill building to the community and, by the same token, welcome the community into the building. With construction still on-going, the art has been an ideal ice-breaker for a community teeming with questions for its looming, new neighbor. With 22 local and international artists temporarily installed on the 9th floor and community arts organizations on the 3rd level, works and projects in the exhibition reflect, celebrate and contemplate the surrounding community; its composition, history and varied concerns. 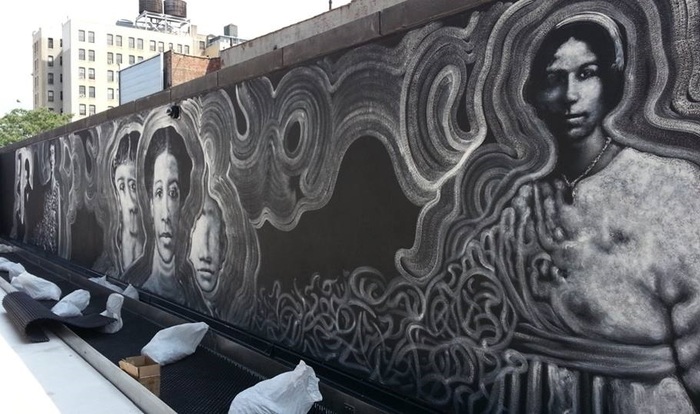 A few highlights include Raul Ayala's Blaze of Glory, a permanent mural in-progress representing African-American women writers of the early 20th century (pictured above); Nari Ward's Sugar Hill Smiles - a project in which the artist captured and canned smiles from Sugar Hill residents in mirrored containers; Dread Scott's Wanted - a two-part project engaging the community's youth and addressing racial profiling, and; Kameelah Janan Rasheed's No Instruction for Assembly, Activation IV - a soulful reimagining of her family's home, as she remembered it before facing displacement at the age of twelve. The HOME Exhibition, on the 3rd floor, invites audience participation and features 12 additional artists, also sharing their memories of home. Harlem Arts Alliance, The Schomburg, NoMAA, Art in Flux et al., are also presenting group exhibitions and interactive engagements on the 3rd floor. The June 25th opening brought well over a thousand visitors to the site. There was live music on the plaza, a parade of food trucks outside (courtesy of Taste Harlem Tours) and, of course, two floors of site-specific art and installations inside. Since the opening, the building has been open to the public Thursdays through Sundays, attracting a steady flow of visitors, tourists and groups each day. In addition to the static display of art, there have been performances, workshops, talks and family events - all of which have been warmly received by the community. While Brooklyn seems to see more of this brand of creative action, a public art event of this magnitude is unprecedented Uptown. With only two weekends left, it all ends on Sunday, August 10th at 6pm. Hours: Thursday and Friday 3-7pm; Saturday and Sunday 1-6pm. The Sugar Hill Building, 155th & St. Nicholas Avenue, Harlem. Directions: C train to 155th Street or M3 bus. Visit nolongerempty.org for more details. Photo credits: Mural and building photos by RECYouth Summer Program/Jackie Robinson Recreation Center; Sugar Hill Smiles photo courtesy of No Longer Empty.